lymphatic drainage, adjacent to portal drainage (yellow) of the small intestine leads to a set of lymph nodes. The lymphatic system collects and cleanses the fluid which seeps out of the capillary beds, bathing the tissue which it perfuses. This cleansing fluid, called lymph, is collected by afferent lymph vessels which carry it to a lymph node where it is filtered. There, macrophages consume bacteria and debris, and immune cells monitor the lymph for antigens which might react with their antibodies and stimulate them to multiply and make antibodies. 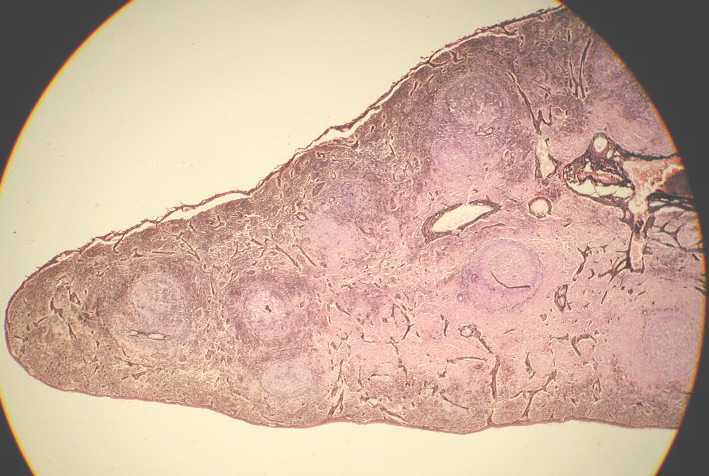 The cleansed lymph leaves via an efferent lymph vessel. The hepatic portal system has been injected with yellow latex, showing the venous drainage from the intestines to the liver. The lymphatic drainage follows the same pattern as the arterial (red) and venous drainage sytems (yellow in the case of the hepatic portal system). 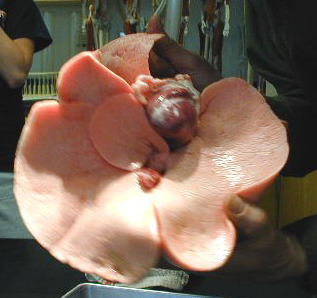 Examine the relationship of the mesenteries to the small intestine in the dissected cat. 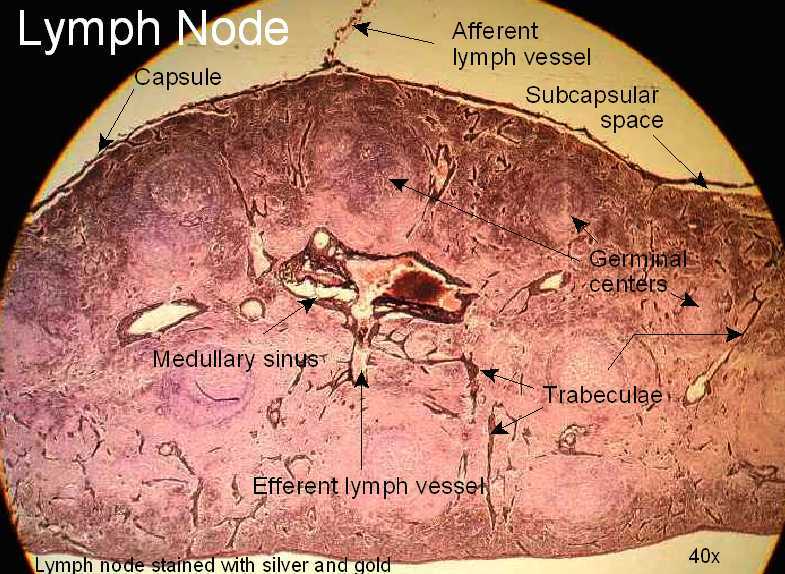 Small afferent lymph vessels (difficult to see) lead to lymph nodes. Once filtered, lymph is carried by the efferent vessels which empty into the cisterna chyli, located behind the abdominal aorta. 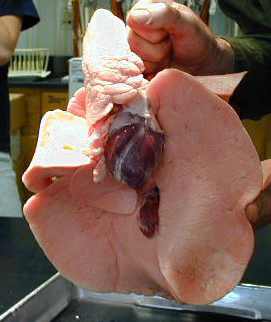 As the cisterni chyli passes through the diaphragm, it becomes the thoracic duct. In the thorax, it may be seen as a thin brown tube to the left of the aorta, under the parietal pleura and the intercostal arteries. Trace the throacic duct up until it passes behind the left subclavian vein into which it empties (next to the jugular vein). 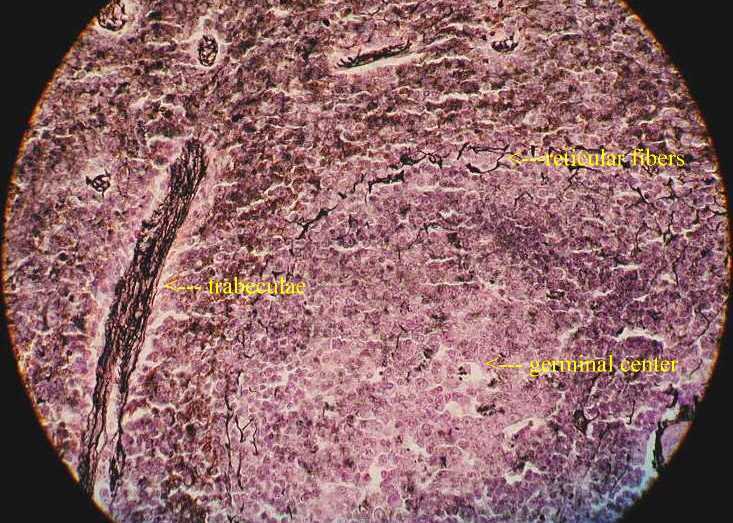 the numerous lymph nodes associated with the ileocecal junction . At 100x, one can see the subcapsular sinus more clearly and the medulary sinus is at the bottom of the image. At 400 x, details of the capsule become clearer. 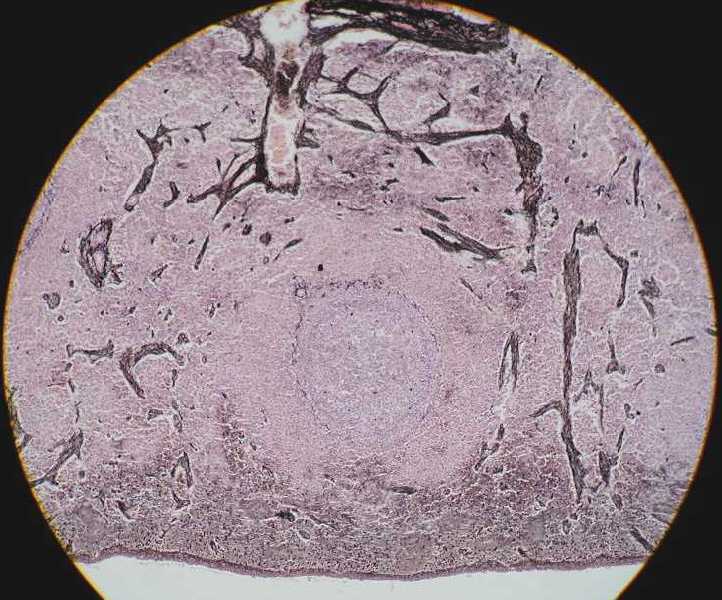 Note the space under the capsule, the subcapsular sinus , which contains the lymph within the node. Here are additional images similar to the ones above, but with slightly different views. Examine these slide at low power first to find the field which best demonstrates the listed features. Label the indicated features, and briefly describe their functions. 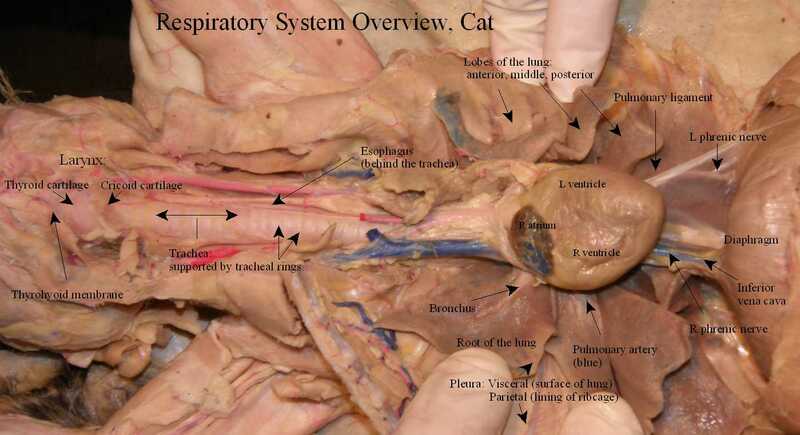 Locate and examine the following organs of the respiratory tract in the cat. Review the function of each as you locate them. 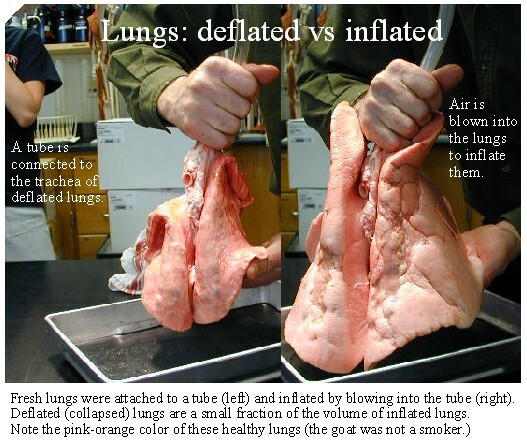 Here is an image of fresh lungs deflated and then inflated to show the dramatic difference in volume. Click to see a labeled view of the system. 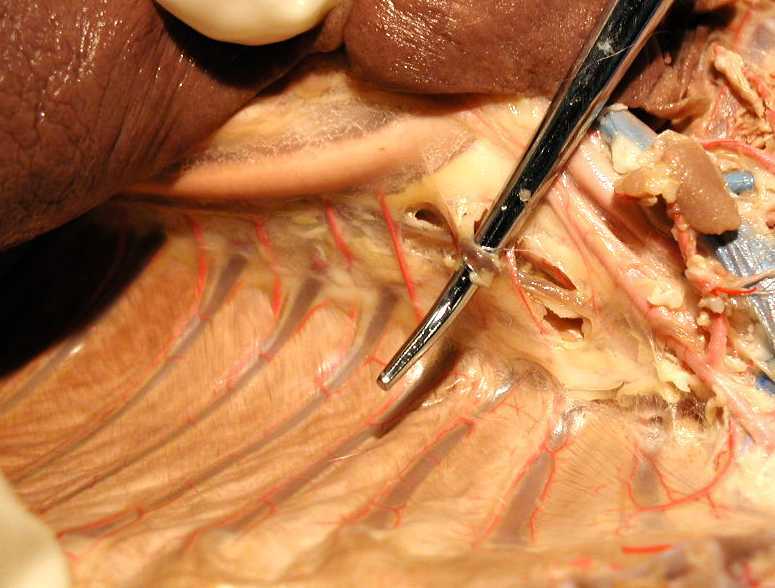 In butchering, the heart and lung are removed from the thorax as a unit. 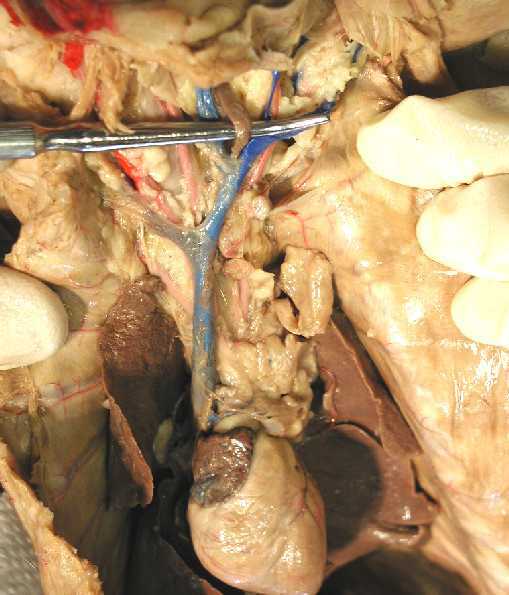 These images show the heart nestled between the right and left lungs of a goat. Here are images of the same preparation inflated (1), and inflated (2). 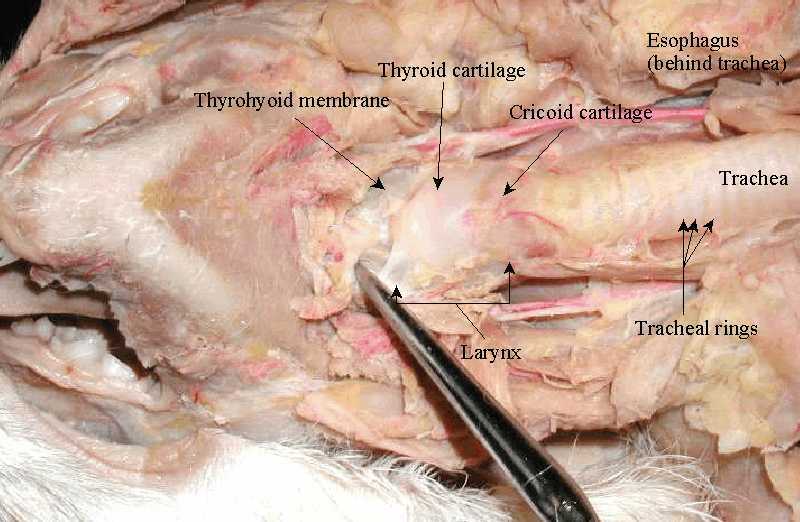 Make a transverse cut through the thyrohyoid membrane and esophagus well above the top of the larynx. Do not cut the epiglottis. Lift the larynx up out of the throat. 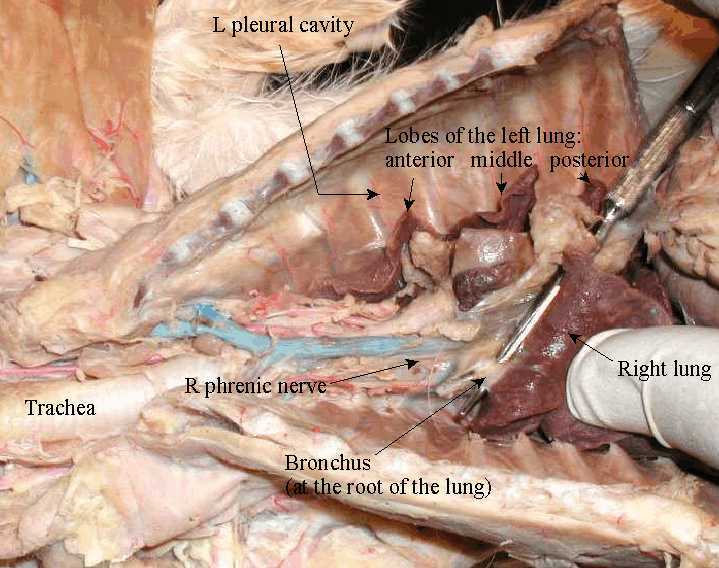 Snip the esophagus to open it up to below the larynx. 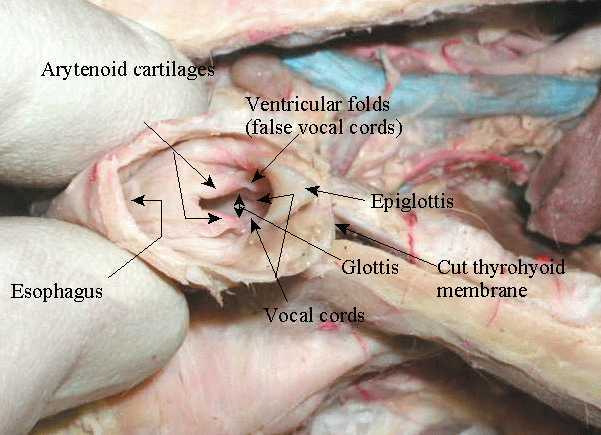 Here is a labeled view down into the larynx. Students may make this cut in order to view the following set of features. 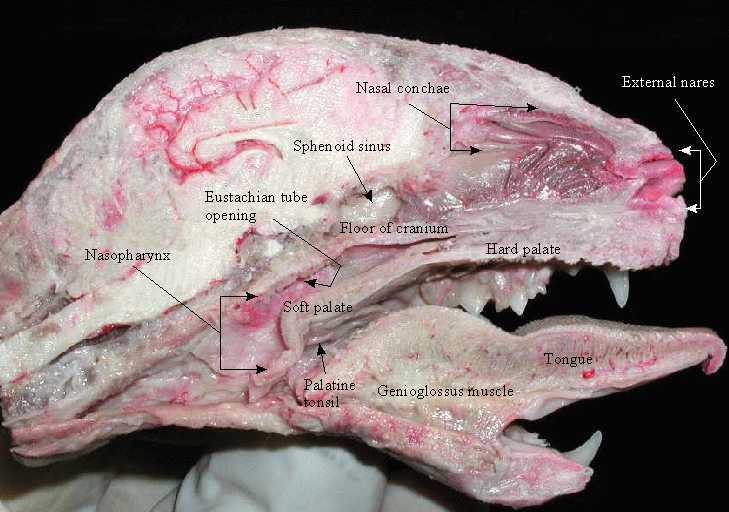 First, taking care to be exactly mid-sagittal, make a clean cut with a sharp scalpel through successive soft tissues of the tongue (from below) and pharynx to bone (through the neck to the vertebral column), then use a sharp hacksaw to cut through skull and vertebra. Wash the cut surfaces to view the features more clearly. Note that one half will show the nasal septum, the other the conchae. Here is a labeled view of a midsagittal section of the head.